Get a sense of the local culture at Fort Christiansvaern and St. George Village Botanical Garden. Take a break from the city and head to Scuba & Snorkeling and Cane Bay. There's lots more to do: see the vivid underwater world at Buck Island Reef National Monument, take a peaceful walk through Salt River Bay National Historical Park and Ecological Preserve, identify plant and animal life at Sandy Point National Wildlife Refuge, and look for gifts at Crucian Gold. To see reviews, photos, more things to do, and tourist information, refer to the St. Croix trip itinerary website . If you are flying in from United States, the closest major airports are Henry E Rohlsen Airport and Cyril E. King Airport. In June in St. Croix, expect temperatures between 89°F during the day and 77°F at night. 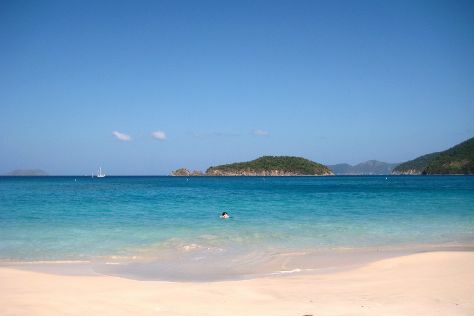 Cap off your sightseeing on the 11th (Tue) early enough to travel to Virgin Islands National Park. The hills, valleys, and tropical rainforest of Virgin Islands National Park tell only half the story, with just as much (if not more) to be found under the sea. On the 12th (Wed), make a trip to Annaberg Sugar Plantation, kick back and relax at Maho Bay, and then kick back and relax at Cinnamon Bay Beach. To find where to stay, ratings, traveler tips, and tourist information, read Virgin Islands National Park trip planner . Getting from St. Croix to Virgin Islands National Park by combination of flight and ferry takes about 1.5 hours. Other options: ride a ferry. In June, plan for daily highs up to 89°F, and evening lows to 79°F. Wrap up your sightseeing by early afternoon on the 13th (Thu) to allow time for travel back home.